China’s economic growth has entered a “New Normal” of slower growth, with the economy expanding by 7.4 percent last year and the government setting even more modest target of 7 percent growth for 2015. While this has disappointed many economic players around the world, for China it brought many new dimensions of internal economic adjustments. After growing at a very high speed of double digit or closer to that for almost a quarter century now, the economy has not only seen prosperity but it has its some negative aspects. Chinese economy has now become the largest energy user and at the same time, a huge carbon emitter. It has lots of health hazards to the Chinese people in particular and to the global climate in general. Since other developed countries had in the past emitted much more carbon and already contributed to the global warming, the higher energy use by developing countries like China was tolerated by the arrangement in various UN forums on climate. But the impact on the health of the Chinese people will remain all the same despite of this allowance. So it is very timely for the Chinese leadership to emphasize on sustainable economic development. Currently, China is using around 10 percent renewable energy in the total energy use mix. They had planned to double this proportion by 2030 which will greatly contribute to lower carbon emission. It appears that with the current new scenario, they will reach the target much in advance. The second important measure taken by the leadership is the clamp down on the corruption, most importantly the corruption at higher places. Many big tigers such as minister level culprits have been arrested on corruption cases at the central and provincial level and the campaign has also reached to the grassroots level. This will certainly bring a new wave in the Chinese social dynamics, making much needed corrections of social course towards socialist goals and check the crooked people from committing illegal activities. In general, Chinese people are very sincere and hard working. In order not to let the crooked people take advantage from the fallibility of people, the strong campaign against corruption is very important. During recent discussions in the National People’s Congress, the streamlining of administrative procedure and decentralization was discussed in a big way. Prime Minister Li Keqiang has unfolded programs for major changes in this respect. The number of processes needed for sanctions and approvals will be drastically reduced and the decision making authority will be delegated to lower levels and at much closer to the local level. He said that these measures will not be simply like nail-cutting but it will make major surgeries in the system. For the Chinese government to take such major changes in administrative procedure will definitely change the way of governance in the days to come. As China’s traditional comparative advantage of cheap labour slowly fades away over the coming years, the current drive and encouragement for mass entrepreneurship and innovation is going to drive economic growth in many ways- from helping China move up the value added curve to increasing china’s market share in some key sectors such as high tech industries. It is quite appreciable that even at lower growth rate China is continuing to deliver the necessary jobs for the young educated mass. The new economic scenario will create space to implement reform measures and also helps in moving the economy away from its reliance on investment and exports. Instead, the economy will now be more driven by consumption and services. China’s $10 trillion economy is bigger than those of France, Germany and Italy combined. By reducing the growth by a couple of points will not immediately bring down its current position in world economy. USA had only about 2 percent growth in its economy in the last decade but it is still at the top of the chart in the world. The change process in China will have far-reaching positive wave throughout the world, as she is expected to focus on balanced, high quality and sustainable economic growth in an orderly and well thought out manner.Chinese authorities are planning a “dual-engine” strategy that encourages entrepreneurship and innovation in society and simultaneously increase public products and services. In the current circumstances, China needs both engines to reinvigorate its economic growth and avoid middle income trap. In fact this gradual process will also help in avoiding any kinds of jerk in the world economy. Realistically bringing down the growth target shows the economic maturity on the part of the Chinese leadership. Although there has been shortfall in meeting target last year for the first time for a long period, it is agreed by all that no other large country can claim to have same level of control over its economy.Compared with other major economies like USA and Europe, Chinese economy is still moving much faster despite of lowered growth target. Because of the robustness of its economy built so far, the current measures being taken to promote good governance and environmental preservation would result in slower, safer and more sustainable growth. Together with these economic measures, China has also taken many international economic initiatives such as “Belt and Road Initiative” and opening up of Asian Infrastructure Investment Bank and also the Silk Road Fund. 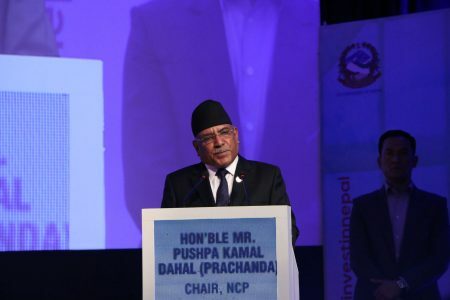 All these developments offer an opportunity for the neighbouring countries like Nepal to work jointly with the Chinese to lift their own economy from the backward state. Tuladhar was Foreign Affairs Advisor to Former Prime Minister Jhala Nath Khanal.